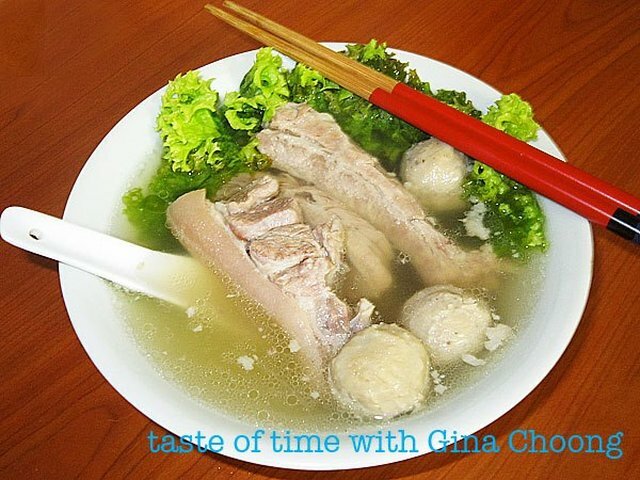 Learn from my hubby that Teochew Bak Kut Teh is clear in the soup. It has no herbs. But he doesn't know how to cook it. After many years of trial and error and eating out at other stalls, this is my method of cooking it. I bought pork balls from the supermarket to add..
1. Wash and clean prime ribs. 2. Blanch in hot boiling water to remove scum. 3. Throw away the water and wash the meat off the tap water. 4. Pour water in the slow cooker and add garlic bulbs(whole), white peppercorns, and semi cooked prime ribs in to boil. 5. Set to HIGH for 2 to 3 hours. 6. To serve, add salt to taste, serve in a bowl of chinese lettuce and rice on the side.